South African playwright Athol Fugard‘s “The Blood Knot” was first performed in Johannesburg in 1961, in a makeshift theater inside an old factory. The performance was both historic and illegal being the first public performance under Apartheid with a black and white actor on stage together. Over the years Fugard’s radical plays have brought international attention to the inhumanity of apartheid, but his plays are far from being purely political; they are also explorations of family and relationships focusing on the deep bonds between people that cannot be severed. 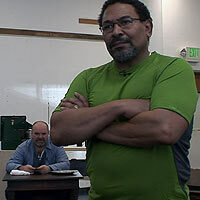 Spark goes behind the scenes of the 2008 production of “Blood Knot” at the American Conservatory Theater (A.C.T.). Directed by Charles Randolph-Wright and featuring original music composed by singer/songwriter Tracy Chapman, the play has only two characters — a pair of mixed-race brothers played by actors Steven Anthony Jones, and Jack Willis. To prepare for these complex roles, Willis and Jones traveled to Fugard’s homeland, to absorb the sights, sounds, and smells of South African township life. Founded in 1965 by William Ball, A.C.T. opened its first San Francisco season at the Geary Theater in 1967. Since then, more than 300 A.C.T. productions have been performed, along the way winning a Tony Award for outstanding theater performance and training. A.C.T.’s conservatory was the first training program in the United States not affiliated with a college or university that is accredited to award a master of fine arts degree. Danny Glover, Annette Bening, Denzel Washington, Benjamin Bratt and Winona Ryder are among the conservatory’s distinguished former students. A.C.T.’s performance, education and outreach programs reach more than 250,000 people in the San Francisco Bay Area every year. Meet a cartoonist and painter along with a cast and crew -- all dealing with politics.